PFOA (perfluorooctanic acid) and PFOS (perflurooctane sulfonate) are organic synthetic chemicals that have been used in manufacturing a multitude of industrial and consumer-based products including coatings, carpeting, and fire-fighting foams. Over several decades, they have contaminated the environment, specifically our drinking water sources, causing significant health concerns that recently prompted the EPA to take action. THE 2016 HEALTH ADVISORIES for PFOA and PFOS issued by the EPA stated that consumption of drinking water containing these contaminants may cause serious health issues affecting several vital organs and the reproductive, developmental and immune systems in humans. TIGG’s water-purification systems are currently removing PFOA AND PFOS contaminants from municipal drinking water sources in several locations across the country, ensuring safe drinking water that meets or exceeds the latest EPA regulatory guidelines for these hazardous chemicals. 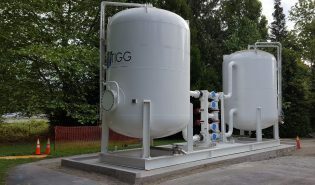 THE TIGG CP20K-10 and CP20K-12 deep bed, backwashable, dual vessel skid adsorption systems using TIGG’s 5DC virgin coconut granulated activated carbon media removes PFOA and PFOS to non-detectable levels in potable water. When operated in a series mode, our systems will provide 100% redundancy to ensure a safe water supply. 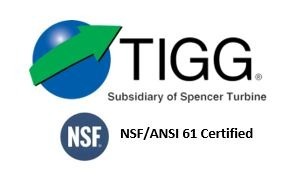 TIGG’s systems install in 8 hour or less allowing drinking water suppliers to quickly and effectively reclaim wells that were shut down due to PFOA/PFOS contamination. These dual vessel systems come in a variety of sizes, many of which are available for immediate delivery for sale or rental. With close to 40 years experience, TIGG’s engineers and technical experts are some of the best in the field. They work closely with clients to study each situation to engineer the optimal treatment solution utilizing the best media and equipment in the marketplace today. Purchasing TIGG’s proven water purification systems provides a permanent solution to contaminant problems. TIGG also rents these systems on a service basis to allow further study of the characteristics of contaminated water sources in the field in real time or to defer the capital expenditure. These systems are currently used by municipalities in New England, Washington and other areas to provide their customers with purified potable water free of PFCs along with most other common contaminants.